Handmade in Colombia of discarded, recycled and repurposed glass, these pilsner beer glasses are sure to add a sophisticated twist to any bar collection. Sturdy and strong, the heavy glasses have a slight green hue from the building and car window tints originally added to lessen the sun's glare. 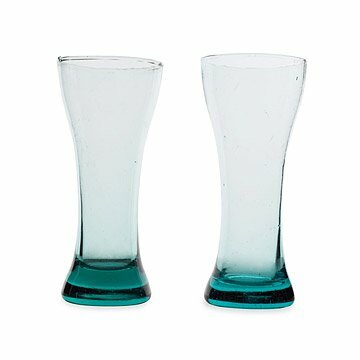 Let the sunshine in with these beautiful and interesting glasses. Due to the hand-crafted process, the texture of each item will differ. Air bubbles and small "imperfections" add individual charm to each one-of-a-kind piece! Please note, this also increases the fragile nature of the glasses. Use with care. Really great product. have an interesting greenish blue tint like windshields. Glass is thick and the glasses seem durable. Gave as a gift and it was a hit. These have to be the nicest pilsner glasses I've ever seen. They are very nicely weighted, have a sturdy feel, and are generously sized. They fit comfortably in my hand, and even more importantly, my husband's "paw". (Size 13 wedding band, just to put that into perspective!) The slight green tint isn't a problem, and provides an opening to explain how they're recycled glass, etc. Of course, they're also ideal for other beverages, and have become my favorite glasses when setting the dinner table for any occasion. Looove these beer glasses! This is our second set. They are a great size, very durable, and a pretty good deal for [$]! Fun product; the imperfections remind us they are from recycled windshields. Fun conversation pieces; and, of course, useful. My husband likes the large size and shape of this pilsner glass. Makes a good present for a beer drinker. Gave as a gift, but cool enough to keep! I was bummed it didn't come with an explanation of how they were made. That would have made the gift even better! I felt like I had to explain how they were made and what made the glasses special. Great store with the most interesting things. I like to recycle and this store is the best! LOVE that these are made from recycled glass, they aren't exactly the same, and easily hold a full bottle of beer (or a lot of water). I've only had them in the dishwasher once but no issues so far. These one of a kind pilsner beer glasses are handmade from recycled glass.